I have made some progress on the pyramids quilt. 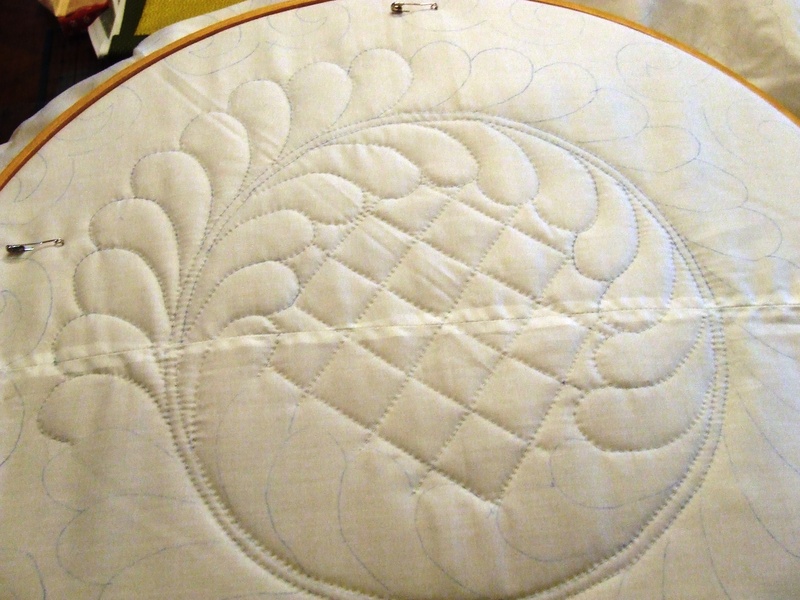 I think you can see from the picture how much quilting is left to go. I can’t predict how long that will take but I do know that when I get this close I have a hard time stopping! This entry was posted in Quilts and tagged antique quilt, hand quilting, Quilts, thousand pyramids quilt, vintage quilt top. 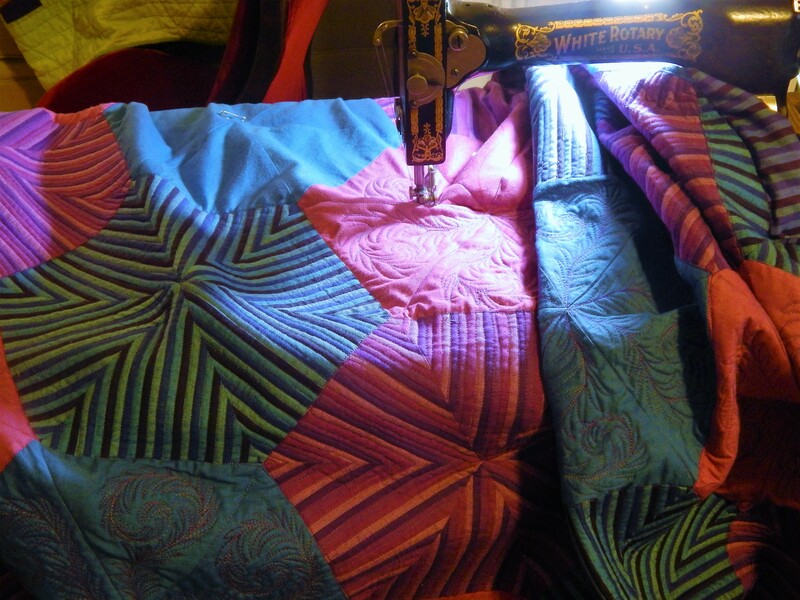 It is amazing how much the quilting changes the quilt! A great transformation. Oh, it looks so pretty! How do you like your hoop with the stand? Is that what you are using? I really love the backing that you chose. Those little diamonds of floral really give it life and appeal to me. I have been using the new hoop with the stand…I like it…it is 22 inches across so I dont have to re-hoop as often. 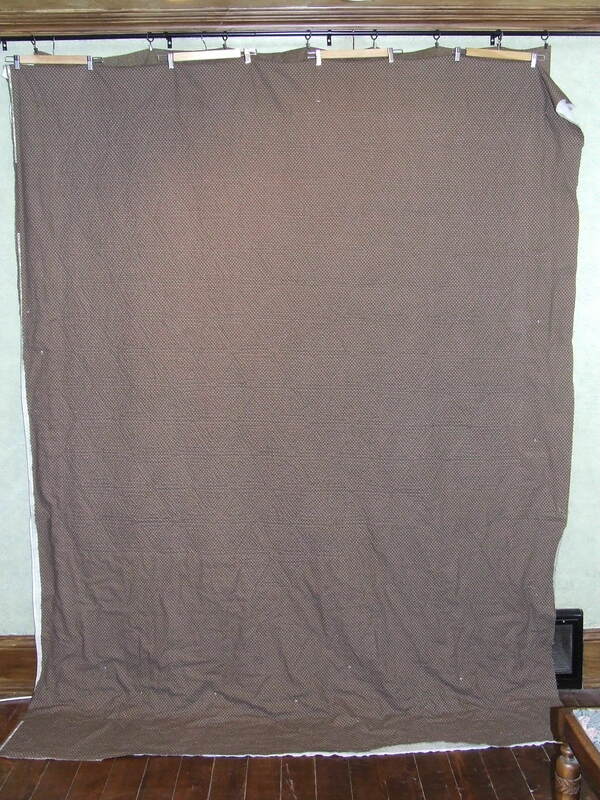 The backing fabric was a great find because it is 108 ” wide, so no seams! 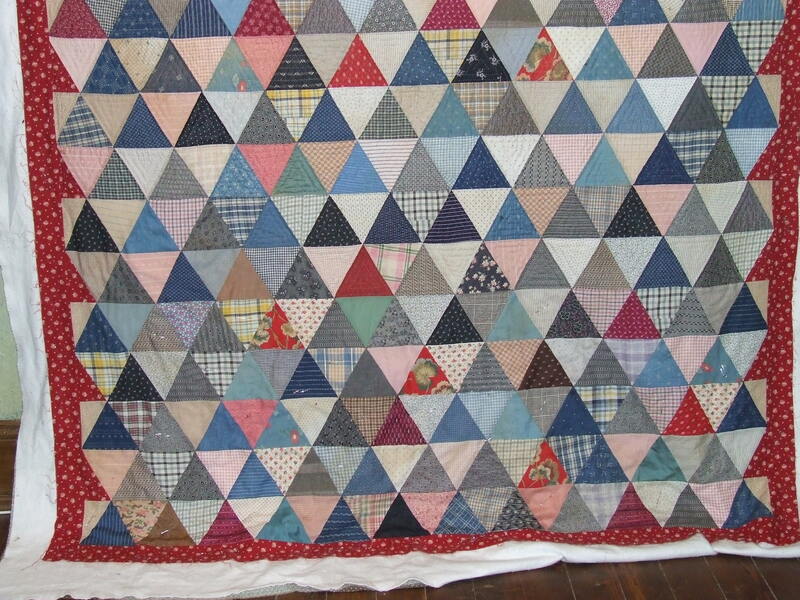 My grandmother and mother made quilts like these with the triangles. Mom made hers totally out of plaids spaced out with a solid triangle in between. 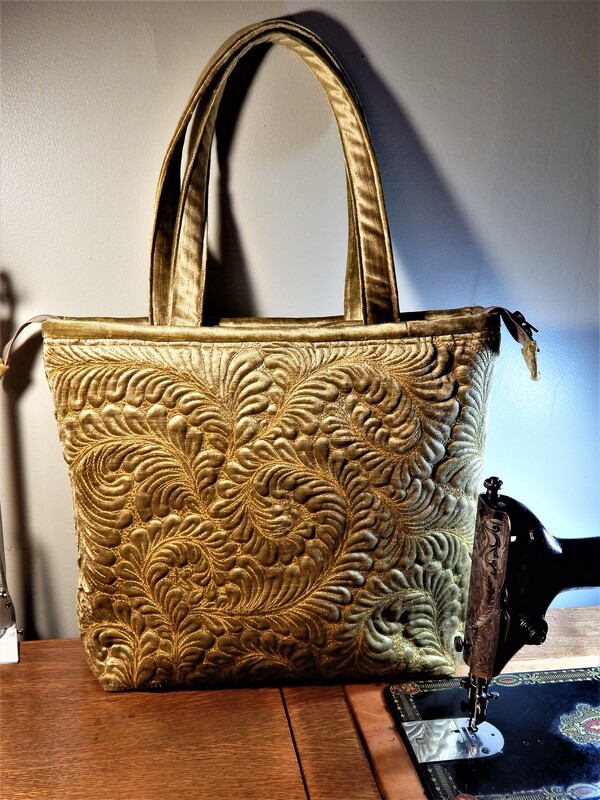 My grandmother made hers like the one you are working on. When I saw the quilt I suddenly remembered I have a shoe box of her triangles cut out and ready to put together. Now I only have to remember where I put them. I am amazed at how fast you quilt. You must stay up all night?! Tim, I am a beginning quilter and have commented on your site before. I look forward to see what you are doing and what I can learn. I was recently given quilts from my great-aunt that I believe were quilted between 1920 – 1960. Some could be earlier. She used quilt patterns, but the fabric was very mixed with a consistent background color (I now see mostly matched fabric collections now). Was that typical for the time to use whatever they had? They are priceless to me, but does that make a difference in the value? PS I did see a Gee’s Bend exhibit and it was such an example of personal art. 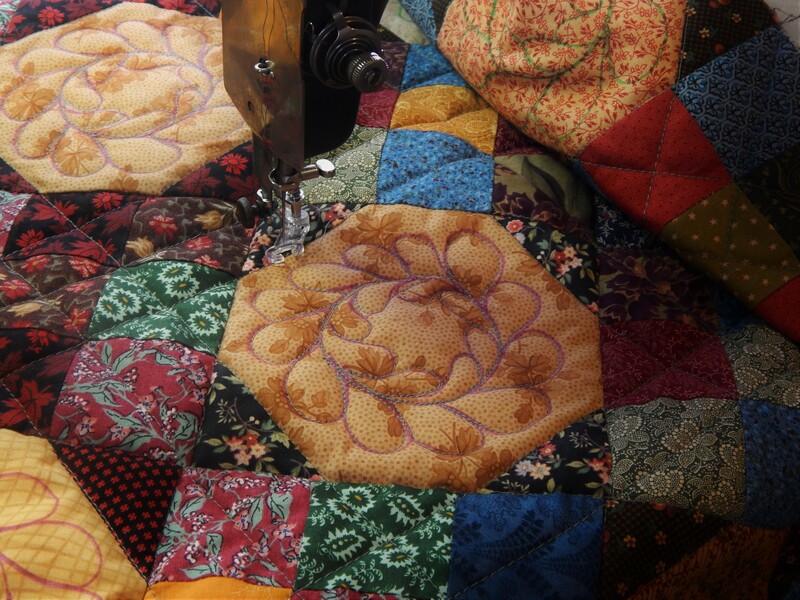 What a great treasure to have, family made quilts are so much more special! Your quilt is looking great! Love the mix of prints in it, esp. the unexpected ‘big’ prints. When I see quilts like this, it makes me think that sometimes I should probably be more relaxed about my fabric choices & combinations.